We've started grilling season early at our house, and the past few weekends have been spent on our back deck, grilling an assortment of meats and vegetables while drinking a glass of something ice cold alongside it. But let's be honest, if you live in Texas, it's practically grilling season year round. Summer is just better for grilling though because of all the summer produce! While grilling nearly anything with a bit of olive oil and salt and pepper is really good, doing those things and then serving it with a tangy, flavor packed romesco sauce is even better. The other weekend, I experimented with this romesco sauce while Kyle was grilling some chicken and assorted veg. We spooned it on top of everything and WOW. It took things up a notch! I've been told that you know you are a good cook when you start making sauces. Sauces are everything. It's where all the extra flavor is, and it elevates something that is already good on its own to something even better. According to the internet, romesco is a red pepper sauce invented by fishermen in California somewhere to be eaten atop, well, fish. It is also normally made with almonds. I swapped in walnuts here for a chunkier (and almost meatier? if that makes sense?) texture. Y'all, if you have never made a romesco sauce before, you need to this summer. It goes great on everything!! Naturally, it is a match made in heaven when it comes to potatoes. These smashed potatoes require two steps: boiling and then baking, but it is oh-so-worth-it. Bring your potatoes and water to a boil while you casually make your sauce in a food processor (or blender). If using baby potatoes, they will cook in no time, and then just smash them with the heal of your hand or with the help of a fork, and roast until the edges and bottom are golden crispy goodness. Are you drooling yet? Place potatoes in the bottom of a large pot. Fill with water and set on the stove over high heat to bring to a boil. While waiting for the water to boil, combine all of the romesco sauce ingredients in a food processor. Pulse until smooth. Taste and add more salt and pepper if needed. Set aside. Once the water is boiling, cook the potatoes, uncovered for 8 - 12 minutes, or until tender and a fork can slide easily in and out of the potato. Drain, and set aside for a few minutes to slightly cool. Preheat oven to 425°F. Drizzle two large baking sheets with a little of the olive oil. Arrange potatoes on baking sheet and crush with heel of your hand or with a fork. Drizzle with more olive oil on top, and season generously with salt and pepper. Bake in preheated oven for 25 minutes or until golden and crisp. Serve immediately with romesco sauce. Last weekend, we discovered two great things in our hood: Baklovah Bakery and the international food market right next door. I never thought I would find anything like either of those two things in San Antonio, but, despite my complaining and lack of faith in the diverse food options here, lo and behold, there is Baklovah Bakery! FRESH. PITA. BREAD. for only $1.00! Y'all, I haven't been so excited in awhile. They had so many different kinds of pita bread too. 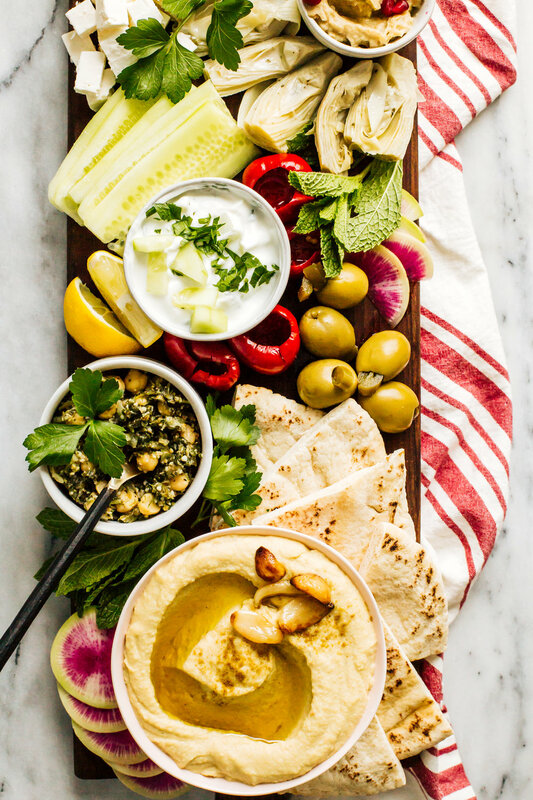 Naturally, we bought some immediately and then headed home for a mediterranean inspired dinner, which included this mezze platter. What's a mezze platter you ask? Um, only the best way to start a party and feed a crowd (or you know, just the two of you!). It's a platter filled to the brim with goodies like hummus, tzatziki, pita, stuffed grape leaves, olives and more. It varies by region but is traditionally served in areas like Israel, Lebanon, and Greece. If you want to upgrade your cheeseboard to something a little healthier, you need a mezze board in your life. With homemade roasted garlic hummus, of course. One thing that I almost never buy anymore is store bought hummus. 90% of the time, I make it at home. It's so easy and tastes so much better, plus I know exactly what's going into it. When I have the time, I will roast some garlic to go into it too because if you are a hummus fanatic like me, then you know that roasted garlic hummus is arguably the BEST type of hummus out there. On a medium sized platter or board, arrange all of the ingredients. Let sit out on the counter for 30 minutes before serving to allow to come to room temperature. makes about 2 cups - save leftovers in the refrigerator! Slice the top (about 1/4") off the head of garlic to expose the tops of the garlic cloves. Wrap in foil and drizzle with a few teaspoons of olive oil. Roast in a 400°F oven for 35 - 45 minutes or until soft and golden. Let garlic cool slightly before pushing the individual cloves out. 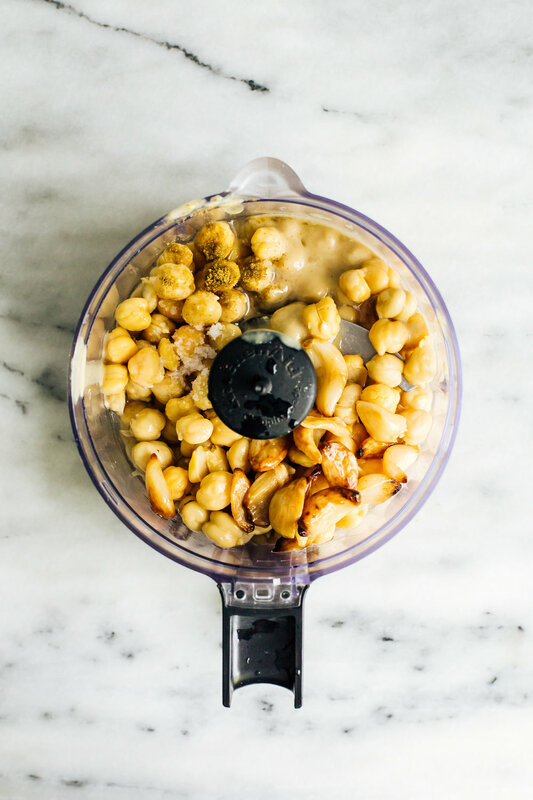 In a food processor, combine the roasted garlic and the rest of the ingredients. Pulse until completely smooth. If necessary, add a little more olive oil (a teaspoon at a time) to get desired consistency. 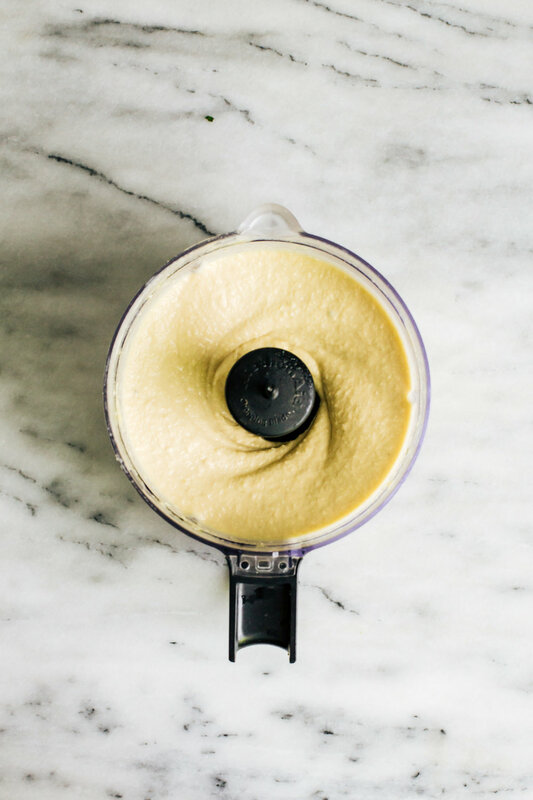 *If you want super duper smooth hummus, peel each and every chickpea from its outer shell after rinsing them. If you don't want to do this, you will still get really good hummus, it just might not be as silky smooth! You probably won't believe me when I say that I get just about as excited for vegetables as I do for mac and cheese or doughnuts. But y'all, it's no lie. 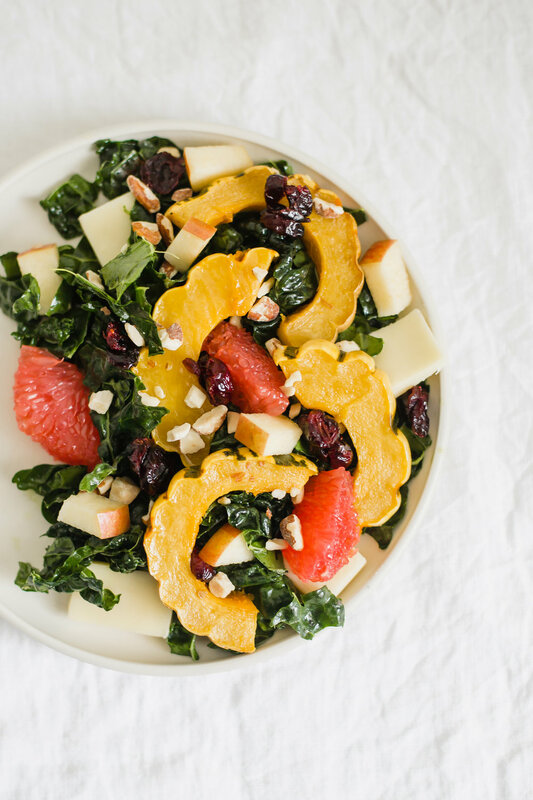 Before you exit out of your browser because this is a salad (!!) let me explain myself. I wouldn't be sharing a recipe for salad unless it was really good and a favorite. Trust me on this. As much as I love neutrals and minimalism in clothing and home decor or whatever, when it comes to food I love color. And I love this salad, because of all the colors and flavors and textures. 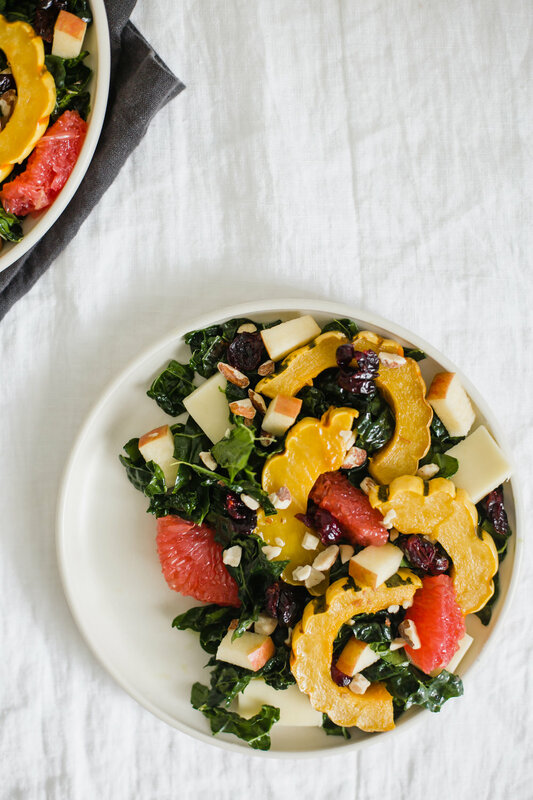 Yellow orange squash, pink grapefruit, red apples, green kale, and dark red dried cranberries make my eyes and tastebuds happy. 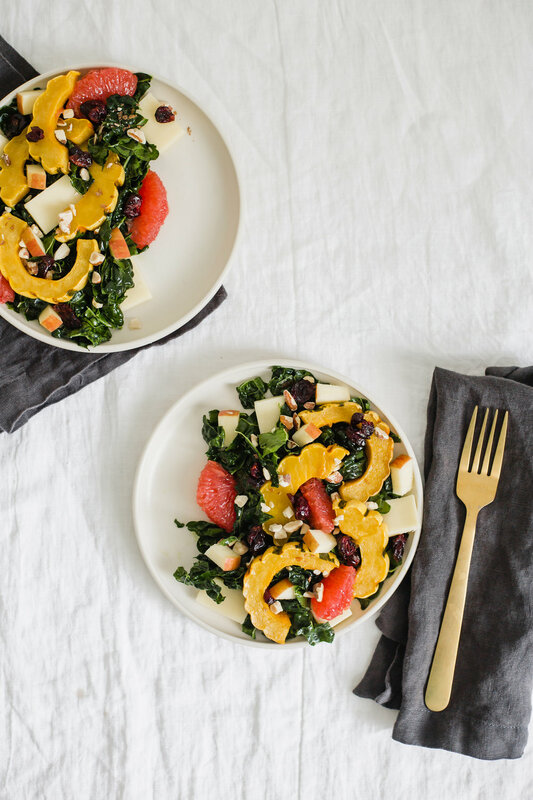 This salad is inspired by one I would get frequently (erm, several times a month) at Flower Child in Austin when we lived there last year. It is the BEST. We would walk there from our apartment for lunch or dinner with Sibbie in tow, and eat lunch on the patio while people watching everyone at the Domain. 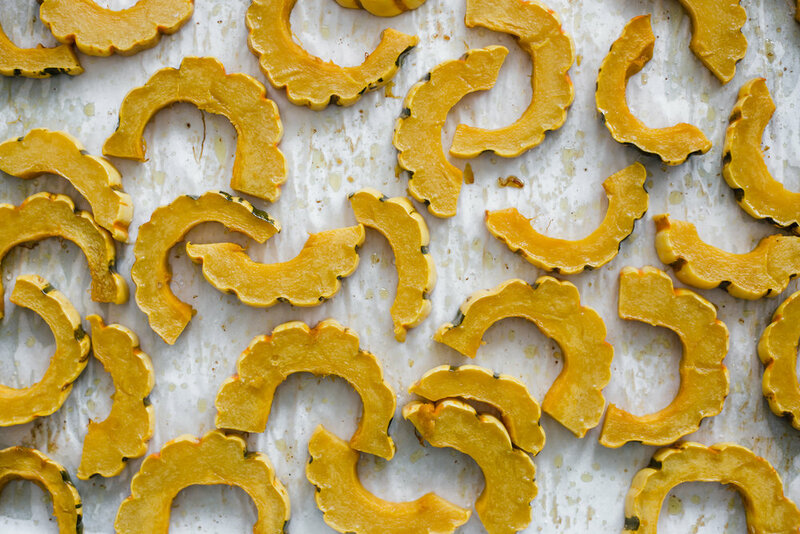 A couple of things they do differently with their salad include using dried currants and omitting the squash. I went to two stores and couldn't find dried black currants, but if I had found some I would have definitely used them! While the next month or so is going to be all about holiday baking and sweets and comfort food, I like to balance it all out with as many salads as possible. This one will be made several times over the next few months! makes about 1 cup - save the leftovers in the fridge for a marinade or another salad! To make the vinaigrette, combine all ingredients in a mason jar or other jar with lid and shake until all ingredients are mixed together. Alternatively, you can whisk all ingredients together in a bowl until combined. Rip the washed kale leaves into small, bite sized pieces. Add to a large bowl, and toss with as much vinaigrette as desired (we only used a couple of tablespoons). Massage kale leaves with your hands until soft, about 1-2 minutes. To the bowl, add the rest of the salad ingredients and toss to combine. Serve evenly between two plates and enjoy!